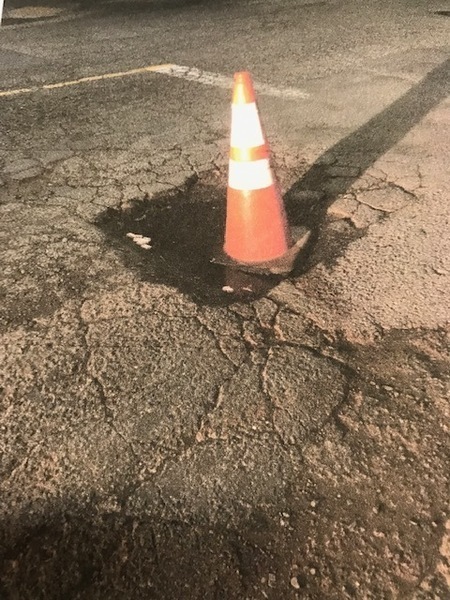 There is a huge pot hole at the corner of Perkins and Vernon. It is a huge discrepancy as there is a non profit organization right across that services adults with developmental and intellectual disabilities. As you can see from the photo it is not safe to cross the street! OAK 311 has received this issue. Your service request ID is #897834. Thank you, in advance, for your patience as we work through a backlog of pothole service requests. Unfortunately the City does not have enough funding to repave all streets in poor condition. With limited funding, our response to resurfacing requests is limited to minor pavement and pothole repairs only. Our Street Maintenance Department will assess your street and determine whether temporary measures might be appropriate. Please understand that this work may be limited to pothole or other minor repairs, and that we have many similar requests. We will do our best to respond in a timely manner. The backlog of streets in Oakland needing pavement currently is $435 million and growing. OAK 311 has received this issue. Your service request ID is #897095. Please check back for status updates, or contact us directly at 510-615-5566. The City of Oakland addressed this issue on 04/22/2019, service request #897095. OAK 311 has received this issue. Your service request ID is #894982. Please check back for status updates, or contact us directly at 510-615-5566. The City of Oakland addressed this issue on 04/22/2019, service request #894982. OAK 311 has received this issue. Your service request ID is #892673. Please check back for status updates, or contact us directly at 510-615-5566. The City of Oakland addressed this issue on 04/22/2019, service request #892673. OAK 311 has received this issue. Your service request ID is #892640. Please check back for status updates, or contact us directly at 510-615-5566. The City of Oakland addressed this issue on 04/22/2019, service request #892640. OAK 311 has received this issue. Your service request ID is #892663. Please check back for status updates, or contact us directly at 510-615-5566. The City of Oakland addressed this issue on 04/22/2019, service request #892663. OAK 311 has received this issue. Your service request ID is #892665. Please check back for status updates, or contact us directly at 510-615-5566. The City of Oakland addressed this issue on 04/22/2019, service request #892665. OAK 311 has received this issue. Your service request ID is #897751. Please check back for status updates, or contact us directly at 510-615-5566. OAK 311 has received this issue. Your service request ID is #894329. Please check back for status updates, or contact us directly at 510-615-5566. The City of Oakland addressed this issue on 04/22/2019, service request #894329. OAK 311 has received this issue. Your service request ID is #897677. Please check back for status updates, or contact us directly at 510-615-5566.